hard corals | Sea Horse, run! The common name ‘Bubble Coral’ may bring to mind an image of a soft, pliable animal, but bubble coral is actually a reef-builder known as a true, hard coral. The polyps or tiny animals that make up this colony have twelve or more legs. Bubble corals are often found in deep water near the base of a reef which is why specimens in aquariums require a gentle water current and low light. The coral skeleton is protected during the day by the inflatable ‘bubbles.’ At night the bubbles retract allowing the tentacles to emerge and hunt for food. This coral can be aggressive. 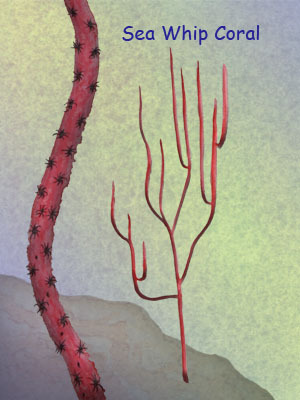 If threatened by another coral, the tentacles will sting and kill its rival. 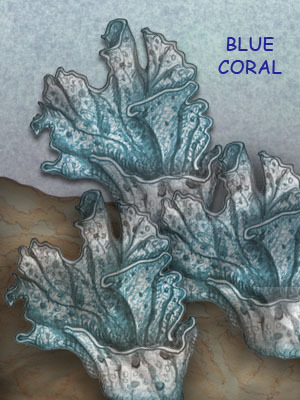 Bubble corals are native to the Indo-Pacific region including the waters around Australia, the Indian Ocean, and Red Sea. Captive specimens are fairly hardy and relatively easy to care for. 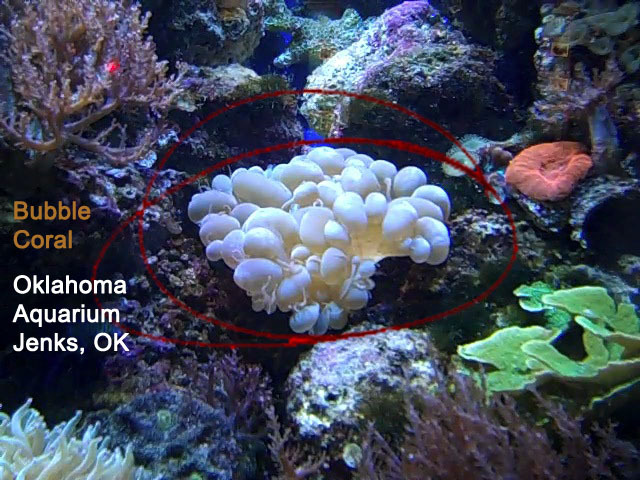 Combine this with it’s intriguing appearance, and its no wonder bubble corals are popular in aquariums. This page includes a complete chart of every coral in “Sea Horse, run!”. 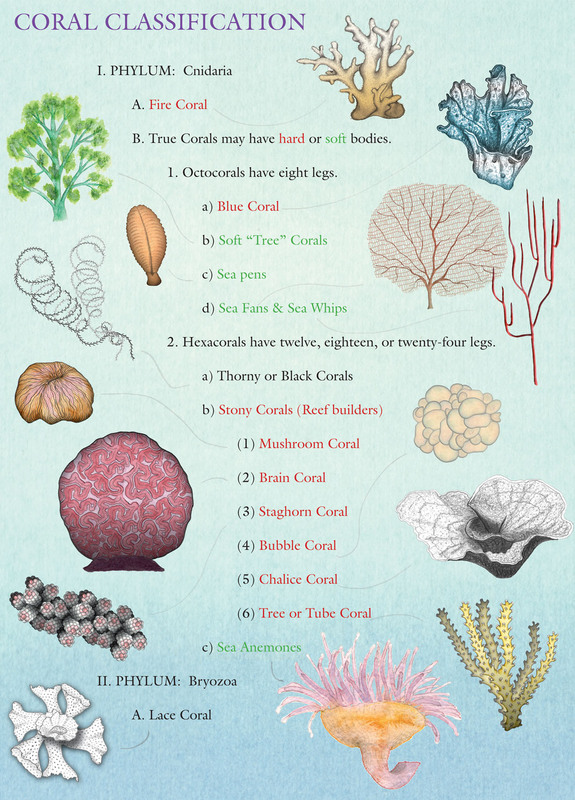 The chart shows how corals are classified in relation to one another. 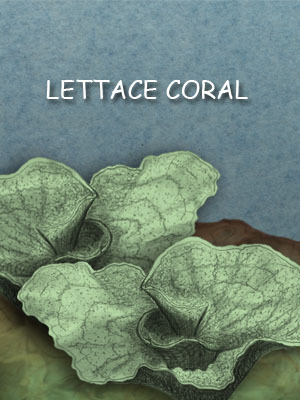 An individual coral may have more than one common name. 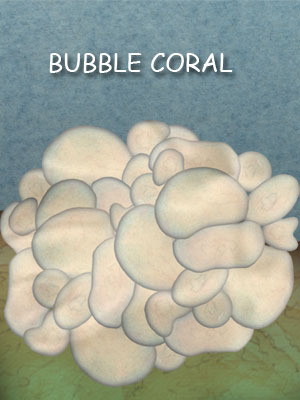 Additional Names for Bubble Coral include Grape Coral and Pearl Coral. 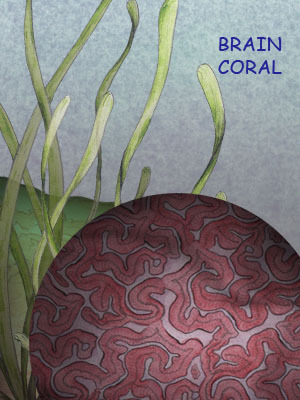 Brain Coral is a hard, reef-building coral. All polyps have tentacles, a mouth, throat, and stomach, but coral polyps do not have eyes. The eyes are the soul of my characters. I put a lot of time and thought into each pair of eyes; however, Coral is an important character in “SEA HORSE, RUN!”, and she does NOT have eyes. 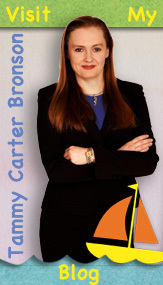 I knew that would make it more challenging for readers to connect with her character, but since my husband is legally blind, I decided her character would give me the opportunity to express that you don’t need eyes in order to ‘see’ and understand the world around you. 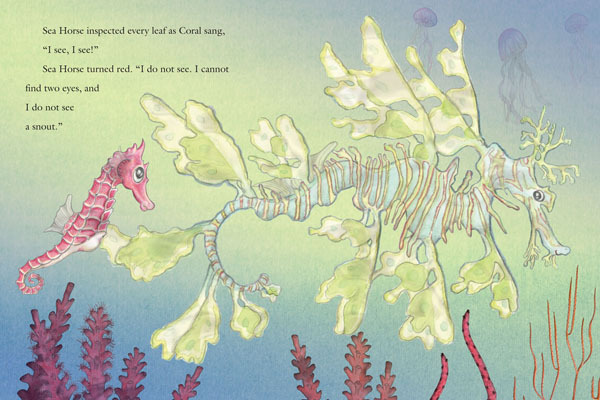 One of the most profound moments in the story is when Coral sings, “I see, I see!” She knows the ‘seaweed’ is the sea dragon long before Sea Horse understands even though Sea Horse has eyes to see. Pages 20-21 of "SEA HORSE, RUN!" 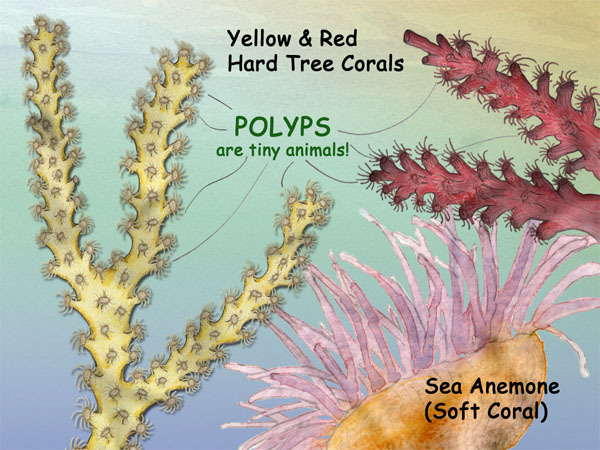 Polyps are tiny animals. 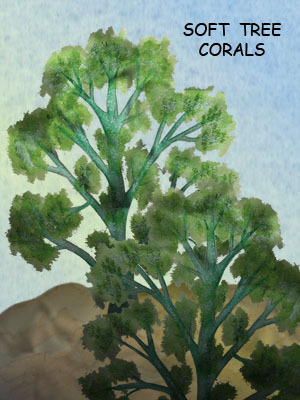 Hard tree corals exist in a variety of colors. The sea anemone is a soft coral. A polyp is an animal. Most polyps are tiny and live in clusters called ‘colonies.’ Polyps may have hard or soft skeletons. Of the 2,400 living species of corals worldwide, two-thirds of the known coral species have soft skeletons, while one-third of the species have hard skeletons. The type of polyp determines the size and shape of the colony. 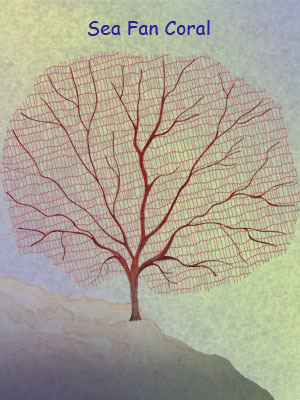 Some colonies look like “trees” while another colony may look like a brain! 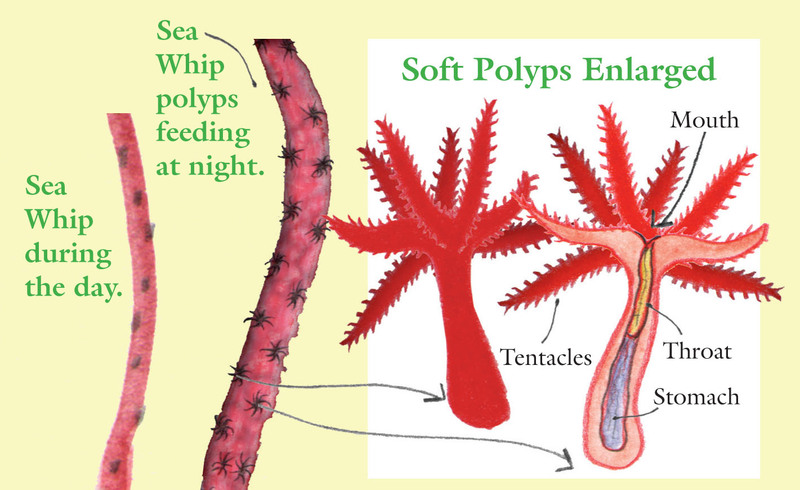 Polyps have tentacles that extend at night in order to feed. 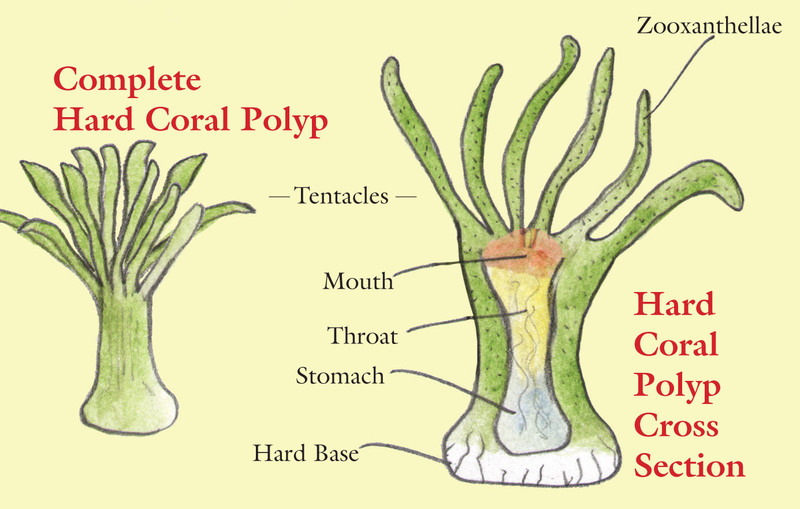 Polyps also have a mouth, throat and stomach. Most soft coral polyps only have eight legs (except sea anemones) whereas other polyps have twelve, eighteen or even twenty-four legs. Colonies of soft corals include: soft tree corals, sea pens, sea whips, sea fans, and sea anemones. Hard coral polyps have tentacles, a mouth, throat, and stomach, but unlike soft polyps, the hard polyps also have a base made of limestone. When polyps with hard skeletons die, their tiny bones create a rock called ‘limestone.’ Coral reefs are made of limestone or the crushed bones of many, many millions of hard polyps! Reef-building corals include: Mushroom Coral, Staghorn Coral, Brain Coral, Bubble Coral, Chalice or Lettace Coral, and Tree or Tube Coral. Some polyps live alone. 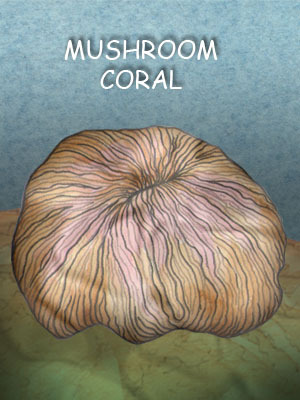 The Mushroom Coral is a large, single polyp.